One of the most important parts of playing the guitar is to be able to play chords. Let's represent each finger with a number. So in the following diagrams of chords, place each number on the appropriate strings as shown below. Once you place your fingers in the spots as shown, brush down on the strings near the sound hole or the body. Can you hear every string? Are they ringing clearly or are they are muffled mess? 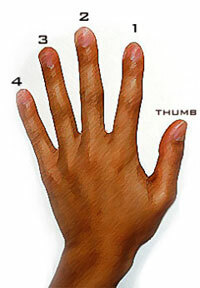 If it sounds jumbled, adjust your fingers so they press down correctly. 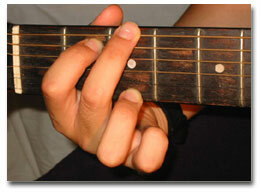 A good tip is to press down firmly with your thumb on the back of the guitar neck. 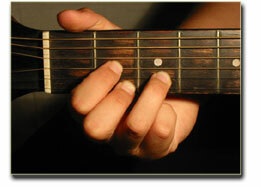 Make sure your fingers are pressing the strings very close to the fret without actually being on the fret. The closer it is, the clearer it sounds and the less you need to push down. Also, your fingernails should be as short as possible too. It prevents them from interfering with the vibrations of the strings. Your other hand should just brush up and down gently on the strings. We will get more into strumming later on, however lightly brush your other hand up and down the strings to get a sound coming out for now. Hint: The "o" represented in the diagram means that the string is to be played OPEN. Whereas the "x" means not to play the string at all. I.e. mute it, or try not to strike it when you are strumming the chord. 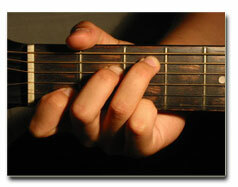 Tip:The G Chord can also be played exactly the same as chord F, only slide the whole chord down two frets i.e. Instead of placing finger 1 on 1st fret, slide it down so that is sits on 3rd fret and let the rest of your fingers follow.